Dolphin Shopping Centre has supported Parkstone Grammar School students for the Young Enterprise Tenner Challenge. The Dolphin Shopping Centre in Poole provided two students from Parkstone Grammar School with a space to sell their cotton tote bags for the Young Enterprise Tenner Challenge. Rosie Parkin, aged 13, had a stall in the shopping centre on Saturday 10 March to promote her business concept. For the Tenner Challenge project, Rosie set up ‘Tootle Turtle,’ a concept designed to promote the reduction of plastic bags. 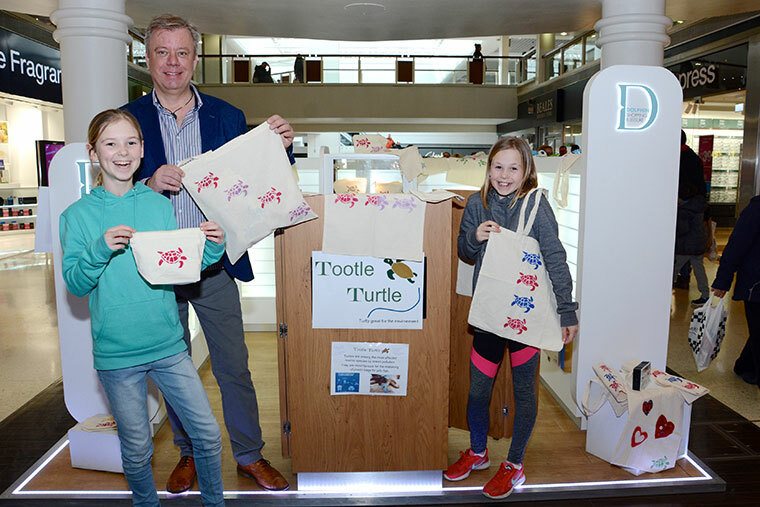 Rosie and her business partner, Chloe Lambert, aged 14, hand-decorated the 100 per cent cotton tote bags to help raise awareness of turtles mistaking plastic bags for jellyfish. The Tenner Challenge, a Young Enterprise initiative, helps to provide a broad and balanced curriculum to further prepare students for adult life. Students are pledged £10 from the Tenner Bank and use this start-up capital to get their enterprise off the ground. Participants are given just one month to make as much impact and profit as they can. The shopping centre provided Rosie and Chloe with a stall in between Animal and The Body Shop from 2-4pm. The bags were sold for £3 and make-up bags for £2.50 and by the end of the afternoon, £47 profit had been made. John Grinnell, centre manager at the Dolphin Shopping Centre, said, “We were happy to host Rosie and Chloe’s stall on Saturday afternoon and were pleased to hear that they doubled their profit.